A watch can be the perfect accessory to complete any outfit. Whether it adds that pop of colour or sparkle, a watch gives you some serious arm candy. As a result of the arm party trend there is now a wide range of watches available. From the classic gold tone to bright neon and in a variety of price points, there is a watch for every style. I, myself have been on the lookout for a new watch since Christmas of last year. Since it will be an investment piece I have been taking my time in picking out a watch. Below are some of my favourites. Large but not oversize or boyfriend sized - my wrist is tiny! While the Fossil flight was my orginal favourite it looked too big for my wrist when I tried it on. So right now I'm leaning towards the Tommy Hilfiger Kelsey but recently 1&2 have caught my eye. 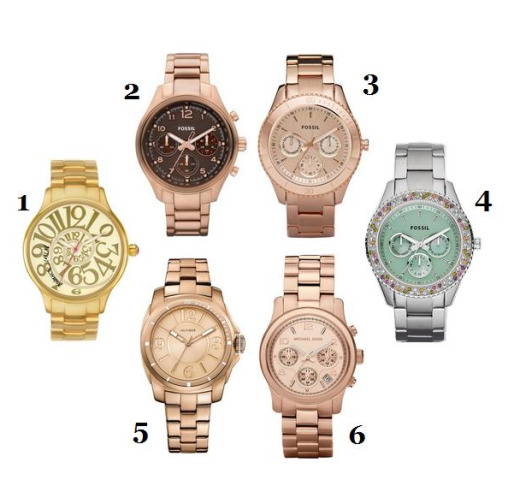 Which of the above is your favorite watch or do you have any other suggestions? And finally what watch are you currently wearing? Those who know me, know that I wear a lot of blue. It's something that I've inherited from my dad. So while I've been incorporating other colors to my wardrobe over the years, blue is still my go to color. There's something so classic about blue and it can be a great neutral to pair with other colors. Right now I'm loving the combination of blue with gold accessories. Here are some of my picks for the summer. What is your current favourite color combination?